Well after a rough but not shabby tench fishing season the river season was soon upon me. The weather had been warm and dry. My mate Andy (you should have been here yesterday) Cowley and partner in crime had a great tench season on the Cotswold water park. The latterly east winds had proved to be difficult though. However here we were fishing the first 3 day of the season on the mighty H.Avon. 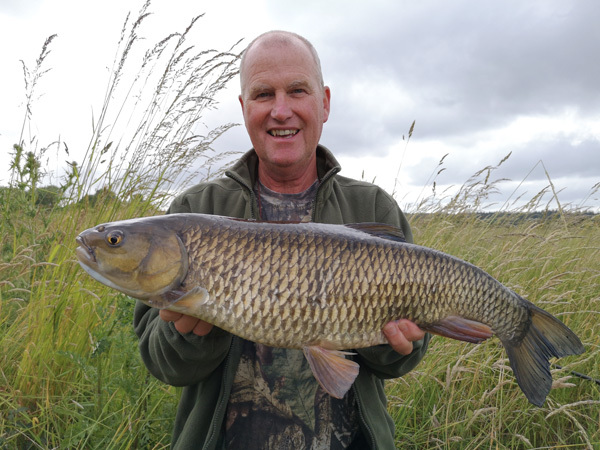 We met early in the afternoon on June 15th and took a look at the Dorset Stour that had loads of good size chub feeding on our pellets. It was wonderful to see these Throop fish. The Avon was more of a problem in-that the visibility was only about 4ft. So fish spotting was more of a challenge. The previous season I had all my tackle stolen while we were fish spotting. This year the tackle was removed from the car. I still thank Adam Firth and Korum for helping me replace my tackle quickly. Andy and I went to the local pub for the evening and chatted about our forthcoming sessions, never dreaming of what was to take place. Up and early in the morning Andy and I headed to the river at about 7am. There was some cloud but warm. Visibility was poor however there were a couple of swims where we could just make out a barbel and some chub. I fished a swim where last year I had some good 6lb chub. Feeding in some pellets the chub were coming up and taking the odd one. It’s more important for Andy and me to have a good look around before fishing. 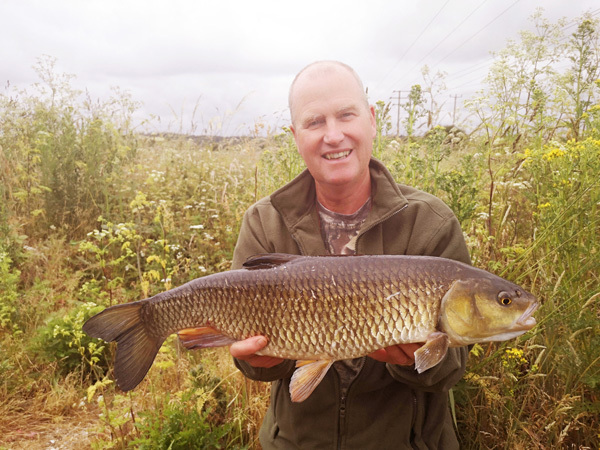 Andy chose a swim which had produced a 13lb barbel for him last year. I was using a short hooklink with a back lead and lowering the bait into a tight area where the chub and a good barbel were feeding. There looked to be 3 good chub coming into the weed and feeding in this tight area. I love this style of fishing as you can see the fish pick the bait up. Fantastic and you learn so much. The first fish to come was almost the perfect start to the season. 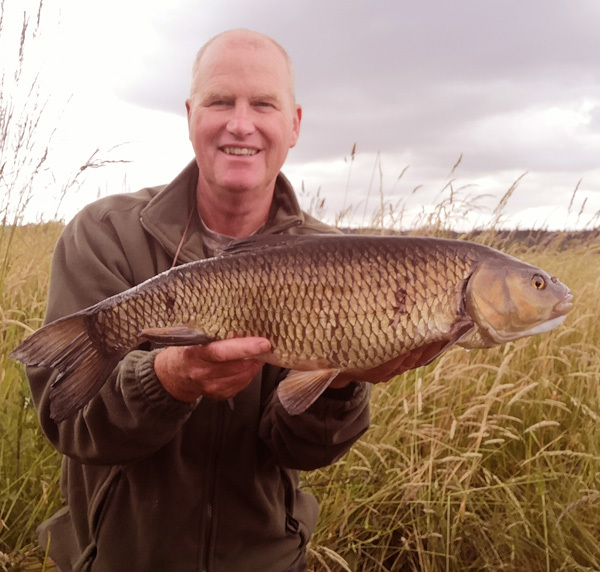 I saw the fish come up pick the bait up the 3oz lead moved up into the water from the river bed the chub shock it’s head and dash off downstream. The fight was terrific with the chub pulling back so hard. I couldn’t believe the size of the thing. As I drew it up for weighing I thought it was over 7lbs. Not being sure Andy was just arriving and he weighed it for me 6lbs 15oz and that is my 3rd one of this weight. Andy did the honours with the camera and thanks a million buddy. I could still see the other two chub coming into the swim and picking off the pellets on the spot. This is so exciting and has the pulse racing. Then the second chub made a mistake and I was so lucky to see the chub come up in the water shaking it’s head but not moving the rod top. The lead too was way off the bottom so it was hooked and trying to remove it. It’s unbelievable to see the chub sometimes shake the hook loose. And a 3oz lead too!! This one was another great fish at 5lbs 15oz, no cigar but close enough. This was turning into a wonderful session. The barbel couldn’t show itself due to the commotion from the chub. The 3rd chub was still interesting in feeding as it came and fed on the tight area. Late on in the day now I was hoping I could catch the trio. At last the chub came and made the mistake and the rod belted around and the clutch gave line as it powered down the deep pool. I couldn’t see the size however it felt a good one again. I couldn’t believe it was another 6lber. On the scales it went 6lbs 2oz. So that was it really the 3 chub I had feeding were all caught and for a total weight of 19lbs. Now that’s some doing. Andy had a few chub to almost 6lbs so he wasn’t complaining. What a start to the season and so much different from last years misery. Thanks to Andy for taking the photo’s and being pestered. Little did I know that this would be almost repeated 2 days later on another stretch of the river. This entry was posted on Thursday, July 12th, 2018 at 9:46 pm	and is filed under Uncategorized. You can follow any responses to this entry through the RSS 2.0 feed. Both comments and pings are currently closed.